Kitchen utensils and equipment have more than just practical uses. Some are imbued with personal meaning and emotions. 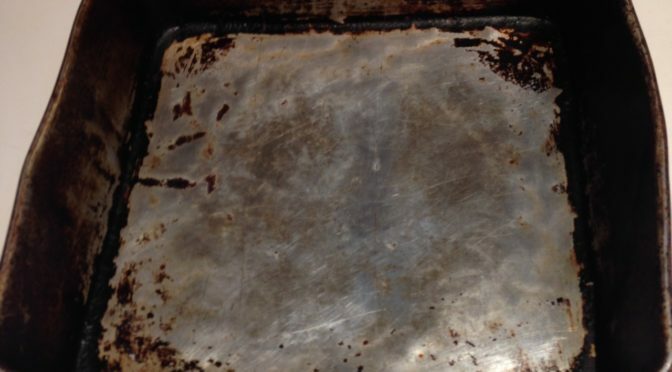 For instance, I’ve got a rectangular pan that is misshapen and looks like it was manhandled by a gorilla. It’s rusted in spots and dented. Yet, I’d never give it up. It belonged to my late fiancée and it has a lot of meaning to me. Similarly, I’ve got a particular fork she was partial to (wouldn’t use any other one) and an oval dish the color of an orange highway construction cone that she insisted on eating everything on. I was curious if I was the only one who had such sentimental feelings for inanimate objects, especially those in the kitchen, so I asked friends on Facebook to share their stories. Theta Pavis: Oh boy do I! My grandfather’s potato masher, mother’s Corning Ware and more. I love that masher. It has an old wooden handle. Erin Logan DeRosa: I have a bowl that I use that my nanny used to bring over her famous chocolate mousse in the holidays. There are scrape marks on it and I to imagine how they got there. I also use her old Pyrex dishes. Makes me feel a connection to her and I am only sorry she never got to know me as an adult. Kathleen Woodruff Wickham: I have a large and a small cast iron skillet. I believe both came from my grandparents. I also have a yellow casserole with a raised fruit design and my great aunt’s pink floral china. Krista Mason: Will send photos of Carla’s (my late fiancée and mother of Garth, Krista’s husband) can opener and mini hammer… which are both displayed proudly in our kitchen. One day I hope to get them both mounted on plaques, as they are “treasured family heirlooms.” They’re my one connection to her in my kitchen… aside from all the cows. Kathy Farrell Sullivan: A spatula and potato masher that my mother received as part of a set for her bridal shower in 1948. Carol Montana: My parents had a knife, not sure what to call it, but it has smaller teeth than a bread knife. Cuts through almost anything. Made sure to take that one when we were cleaning out their house. Also a manual nut grinder. Takes more time than an electric, but makes me think of them whenever I use it. Mom would bake, Dad would chop the nuts. Joseph LoTemplio: I have a wooden spoon my mother used to hit me with. Nancy Garavell: I have my mother’s pink nut grinder with glass bottom that catches the nuts…I still use it. Lindsay DiCarlo: Your aunt Lucille Tortora still has an ice pick from her dad, your grandfather, from his ice box days. Paul L. Saulnier: One item we still have is an old-time ice cream scoop you saw in soda shops that our grandmother must have kept and passed down…wooden handle and all. Blair Craddock: My mom has my grandparents’ Art Deco looking toaster that they got for a wedding present in the 1930s. It still works. Meghan Murphy Borland: My Corning Ware mixing bowls are definitely special. First, it lasts through generations because it’s well made and tough. Second it looks so old school. Third it brings back childhood memories of licking the brownie bowl with my mom. Jane Lerner: I have several pots, one that I use nearly every day, that I took from my grandma’s house after she died. They always make me think of her. Debra Scacciaferro: We had a metal colander with four metal feet and two riveted handles that belonged to my husband’s grandmother, who taught him how to make pasta and gnocchi. We used it until one of the handles fell off. I posted that we had finally lost it, and then a friend of mine sent us his old colander in a surprise package. It always reminded Jim of his grandparents and the big Sunday pasta dinners they would host.